This meeting is organized to discuss about children, whole years celebration & activities in the school. Children wear different colour dress; Carried cut-outs of fruits displayed the cut-outs. They give speech on fruits. Children sang poems and prize is distributed to the winners. Children tie rakhi and teachers say stories about Rakhi to the childrens. Celebration of green day is done by decorating the green plants by teachers. Children dressed up with green clothes and small gifts are distributed to the students on this occasion. On 13th August 2013, Action Song was celebrated in Std. 1st to 4th to bring out the talent of students. Every Year we celebrate the occasion of “Guru Purnima”. This year it was celebrated of 22/07/2013. The whole function was conducted with Prayer, Drama & Speech on Guru Purnima. 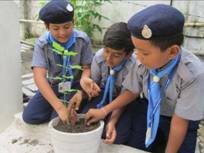 Tree Plantation was done by Scout & Guide Students on 18th July, 2013. They will maintain the trees for the whole year. 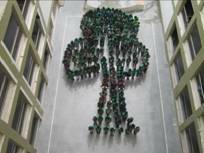 Students give message for “Save Environment” by self creation of Tree. 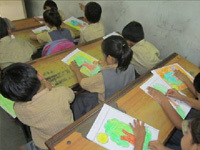 Like Every Year Drawing Competition was held on 15/07/2013 for Std. 1st to 4th & 16/07/2013 for Std. 5th to 8th. Election of G. S. & L. R.
We conduct the Election of G. S. & L. R. of Primary Section, Gujarati Medium every year. The process of this election is held same as election of Rajya-sabha & Lok-Sabha. Voters take ballot papers; go for voting, after giving vote the ballot paper is kept into vote-box. After completion of this process vote counting is conducted and then the Final Result is declared. Result of Elected G.S. & L.R. G.S. of this year is Thakkar Sagar (Std. 8th). L.R. of this year is Mehta Bhoomi (Std. 8th). Rakhi Competition was held on 01st Aug, 2012 in Guj. Med. Primary Section. Students Participated and create rakhi themselves own. 1st Prize Zala Bhuvaneshwri Shaktisinh created a 3’ 7” long rakhi in this competition and won the 1st Prize. Rakhi Celebration was done on 01st Aug, 2012 in Guj. Med. Primary Section. This celebration was started by creating Swastik and Design of School name. The tree plantation program was held by students of std. 6 & 7 Gujarati medium Primary Section on 19th July 2012 as “Environment Day”. 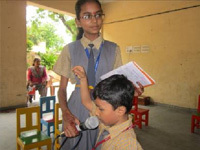 To encourage students our Vice-Principal, Mrs. Nalini Nambiar & Other teachers also participate in this programme. The Competition was held on 19th July, 2012 with the message of “Save Environment”. Shree Narayana Guru vidyalaya Gujarati Medium Secondary section was participate in that competition. Shree Narayanaguru Vidyalaya Gujarati Medium Std. 9 ‘s co- curricular activity “Patriotic Song Competition” organized on 6th august 2011. The Incharge teachers of the competition were Shrimali Bhagirath,Parikh Ketanbhai. The winners of that competition was Nandish ,Ritu Patel of std. 9-A and Shah Shivani,Chaudhri Nirdesh of std. 9-B. 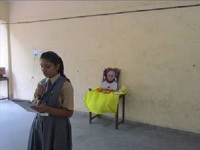 “Poem recitation Competition” organized on 16th July 2011. 32 students participated in the competition. 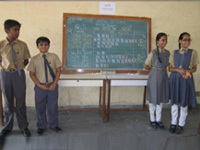 Shree Narayanaguru Vidyalaya Gujarati Medium Std. 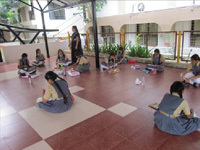 9 ‘s class activity “Clay work Competition” organized on 23rd September 2011. Judge of the “Clay work Competition” were Praffulaben Patel and Urmilaben Patel. “Best from waste” organized on 23rd September 2011. The Incharge teachers of the competition were Jitu sir,Khyatiben Desai. Judge of the “Best from waste” was Rajalben Pandya. Shree Narayanaguru Vidyalaya Gujarati Medium Std. 9‘s class activity “One Minute Show” organized on 3rd March 2012. Shree Narayanaguru Vidyalaya Gujarati Medium Std. 8‘s class activity “Photo Frame Making Competition” organized on 3rd March 2012. The Incharge teachers of the competition were Jitu sir, Khyatiben Desai. Judge of the “Photo Frame Making Competition” was Rajalben Pandya And Pushpaben Kendy. On date 12th August 2011. The Incharge teachers of the competition were Nainaben Tevar and Pushpaben Kendi of Mahendi Competition. The Incharge teachers of the competition was Urmilaben Patel of Tatoo competition. “Bharat ko Jano PrashnaPanch” competition which was conduct by “Bharat Vikash Parishadh” on date 30th July 2011. 200 Students of gujarati medium sec & Hr. Sec section were participate in that competition. In that competition two students of std. 9 was select for second round. “Rastriya Samuhgan” competition which was conduct by “Bharat Vikash Parishadh” on date 16th August 2011. In that competition Gujarati Medium Secondary section’s students got first rank and selected for second round..
On 8th September 2011,the occasion of Onam celebration the students of standard 8th, 9th, 11th took part in Floral decoration competition. They made from different color’s flowers and earthen lamps. For decoration 2 hours was given to them. Our main Incharge were Jaymala kalal and Praffula patel and Groupwise incharge were Namrata Gandhi,Rajal Pandya,Khyati Desai and Urmila Patel who guided the student for Floral decoration competition. Our judges were Shushmita madam and Divya madam,the Lecturer of College came and decided best Rangoli from each group and awarded them. Shree NarayanaGuru Vidyalaya Secondary & Hr. Secondary Section Gujarati Medium was organize picnic for secondary and Hr. Secondary on dated 11 December 2011 and 12 December 2011.The Places of the Picnic was sapteshwar,Adalaj’s wav,Gandhinagar Fun world. Adani Power Foundation was Organize Education Trip For Shree NarayanaGuru Vidyalaya Hr. Secondary Section Gujarati Medium on dated 1 March 2012 and 2 March 2012 .The Place of the Education Trip was Mundra Port . The In charge teachers of the competition were Shrimali Bhagirath,Parikh Ketanbhai. Judge of the “Poem recitation Competition” was Devendrabhai Patel. The tree plantation program ws held by students of std. 8-A and 8-B gujarati medium on 13th and 16th july 2012 to save our environment.the incharge of that activity were Khyati Desai and Jayantilal Charel. It is our duty to save trees so,students of std. 8-A and 8-B gujarati medium held the program of tree plantation in the presence of their class teachers,subject techers and vise principal .they planted various types of plants like Tulsi,rose,mogra etc..
Students was divided into different groups .they took plants,pots from their homes.they put the saplings in to the pot very nicely and carefully and they took the oath to look after those palnts then they keep those plants at proper place. Besides these, they prepared banners, posters and hang them on wall to aware other students for the save environment. they also prepared and distributed different cards relates the topics . With co-operation of all the program was great success.